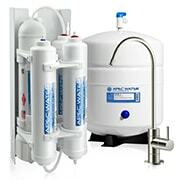 Includes stage 1 to 2 pre-filters, 3rd stage RO membrane, and 4th stage carbon filter. Works with most brands of counter-top RO systems on the market. Recommed changing every 6 to 8 months. rate guaranteed, fast response time. Works with most brands of under counter RO that uses Industry standard sized membranes.